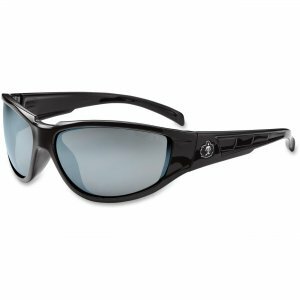 Stylish, medium-frame safety glasses provide an economical choice for outstanding eye protection. Scratch-resistant lenses filter 99.9 percent of harmful UVA, UVB and UVC rays for safe, outdoor use. Flexible nylon frame and strong polycarbonate temple construction provide increased durability. Glasses are tested to ANSI Z87.1+ High Velocity Impact Protection and optical requirements. Glasses are also tested to MIL-PRF-32432 Ballistic Fragmentation, Class 1. Eyewear is perfect for use while working in construction, manufacturing, assembly and more.